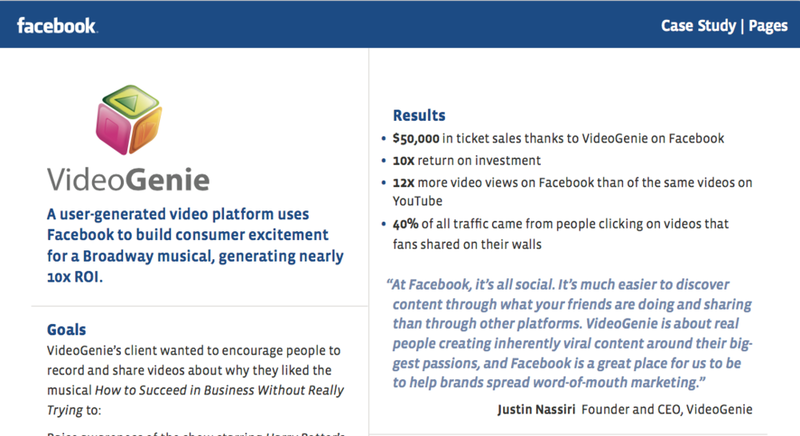 Facebook selected VideoGenie to be the subject of an official case study. Our contest with the Broadway musical, How to Succeed in Business, generated a 10X Return on Investment, and allowed their community to audition to for a trip to New York to meet the cast and crew. With VideoGenie, Levi's asked their community: who inspires you? Their customers recorded short videos, tagged their friends, and inspired others with heart-warming tales. At the end of the campaign, Levi's put together this moving commercial featuring their favorite video clips. At SXSW, Bud Light called this "the best User Generated Content campaign in Bug Light's history." With VideoGenie, Bud Light did a video audition to find their biggest fan. The reward? An all-expense-paid trip to the Super Bowl, and an official role as an online video correspondent. Seventeen Magazine teamed up with VideoGenie to find their next Beauty Smartie. The competition asked contestants to submit videos showing their makeup advice. The winner went on to be the official Seventeen Beauty Smartie, and author of online and print articles for Seventeen Magazine. Angie's List uses VideoGenie to audition customers for their television commercial. They collect hundreds of entries, measure the performance of each, and use a professional film crew to do an in-depth interview with the top performing videos. Post Cereal's Honey Bunches of Oats invites their customers to join them in the world's biggest compilation dance video. Fans grabbed their box of HBO, and through VideoGenie danced along to the Smile While You Shake It music. The winner got $500, particpants were featured in a music video, and everyone had a blast. Intuit invited their small business customers to share where they take Intuit's GoPayment. Business around the world submitted video testimonials, sharing how this incredible product was revolutionizing their company by accepting payments on the go. TripAdvisor uses VideoGenie to simply gather quality videos from their customers and hotel owners. These videos showcase the incredible stories of adventure from their community. They also allow property owners to show off their hotel and all the reasons why people would enjoy their accommodation.